With all the great motorcycle jackets available today, the challenge is not finding a good one, but rather sorting through the options to find the one that?s right for you. If you?re looking at the Alpinestars T-Jaws WP, then you?ve probably already done some narrowing of the list: waterproof textile instead of leather, and waist length instead of a three-quarters cut. So let?s see how the T-Jaws WP measures up in that slice of the market. I tested the T-Jaws WP over a few months and thousands of miles of riding, in temperatures ranging from the 40s (I got it too late for the depths of winter) to 90 degrees, in pouring rain and sunshine, and on multiple bikes. Before we dive into the report card, let’s review the T-Jaws WP’s basic features. The T-Jaws WP is a followup to the leather Jaws jacket that Alpinestars introduced earlier. That explains the name, which for some reason brings to my mind the image of an adjustable tool used by plumbers. Add “T” for textile and “WP” for waterproof to the original Jaws name and that’s what you get. The jacket includes CE-approved shoulder and elbow armor, in addition to foam pads in the chest and back. Photo by Lance Oliver. The shell is made of a mixture of nylon and polyester with a polyurethane coating. Inside is Alpinestars’ proprietary Drystar waterproof and breathable liner, which is sewn in, and a removable, fully sleeved thermal liner. CE-approved armor at the shoulders and elbows is supplemented with two soft foam pads in the chest and a foam back protector. The foam pads can be replaced with an Alpinestars’ Bionic Air Back Protector or Bio Armor Back Protector for an upgrade to CE-approved protection for your spine and the Bionic Air Chest Pads in the front. The T-Jaws WP is available in all-black and red-white-black versions. I tested the latter. The red is a bright shade that’s almost fluorescent, so short of getting a true high-visibility color, this is probably your best bet for getting inattentive drivers to see you. Another conspicuity feature consists of five patches of reflective material on the back and the back of the elbows that really catch the light at night. Handwarmer pockets close with zippers and there’s a Napoleon pocket on the left chest. Other features that are appreciated include inside pockets, on both the Drystar liner and the thermal liner, for items you want to keep dry, a soft material around the collar for comfort, and hook-and-loop adjusters at the waist. The cuffs close with a combination of YKK zippers and hook-and-loop adjusters. That’s one of those little things you may not think about when buying a jacket, but can become a daily source of annoyance if you keep a jacket for years, as I tend to do with my favorites. I like this combo of wrist closures. Set the hook-and-loop adjustment once, then open and close the cuffs with the zippers. Zippers alone provide less range of adjustment, while hook-and-loop alone means you’ll eventually lose grip as you close and open it daily and it wears out. About the sizing: I am 5 feet, 11 inches tall and weigh about 174 pounds, so I wear a large in most jackets and can wear a medium in jackets with a more generous American cut. The T-Jaws WP has a sporty cut, matching its looks and styling, but a large fits me well and leaves room for me to wear the thermal liner and a warm layer of my own underneath. Without the thermal liner, it fits comfortably loose for warm days, but the armor stays where it needs to be. With the waist adjusters loosened, the waist measures a good 40 inches in circumference in the size large, so despite the sporty looks, you can still wear this jacket even if you’ve spent more time doing 12-ounce curls than working out at the gym. I wore the T-Jaws WP for hundreds of highway miles on a bike with a totally upright riding position, and also wore it in a sportbike tuck. The jacket presented no fit problems on either motorcycle. It feels light and comfortable, aided by unusually generous expansion panels on the back of the shoulders and the back of the arms. No matter how extreme a sportbike tuck you assume, the T-Jaws WP won’t bind or restrict your motion. I started using the T-Jaws WP after I’d been wearing an older model of jacket from Alpinestars, the Lucerne. Both are waist-length sporty textile jackets that are waterproof, but the key difference is how the jackets go about keeping the rider dry and regulating temperature. Wearing them back to back clarified for me the pros and cons of the two approaches and raised a key issue that will help you decide whether the T-Jaws is the right jacket for you. While both jackets have a full-sleeve zip-out thermal lining, the Lucerne also has a zip-out waterproof liner and long zipper vents on the arms that move a lot of air because your arms are usually out in the breeze, even on a faired bike. That makes the Lucerne, like others with the same construction, a potential four-season jacket. You can wear it four ways: with no liner, thermal liner, waterproof liner, or both thermal and waterproof liners. In the T-Jaws WP, the waterproof liner is not removable, so you only have two choices: with or without the thermal liner. With a non-removable waterproof liner, any venting allows air to flow into the space between the liner and the shell, which does not provide the same cooling effect as vents that allow air to flow directly to your body. The advantage of the T-Jaws WP’s construction is simplicity. The Lucerne’s two removable linings mean two sets of zippers and two sets of snaps inside the sleeves at the cuffs, which add to the feeling of bulk. Switching between the two jackets, the T-Jaws felt lighter and less cramped when I put an extra layer underneath on cold days. These 3.5-inch zippered vents on the shoulder provide the only ventilation. Photo by Lance Oliver. The downside is that the T-Jaws is really a three-season jacket. Venting on the T-Jaws is limited to two 3.5-inch zippered vents on the front side of the shoulders. There are no other intake vents and there are no exhaust vents. Looking at the vents, I assumed they would have little effect, but the first time I used them on a warm day, I got two big surprises. First, while I expected the vent openings to move little or no air, I was amazed at how the vents popped open in the riding position and flowed a lot of air. Second, I was equally surprised that the open vents actually made me feel warmer, not cooler. How is that possible? Because the vents scooped air into the space between the shell and the waterproof liner, and because there were no exhaust vents, the airflow actually pressurized this space and pressed the waterproof liner tightly against my back. The liner pressing against my shirt held body heat in. There is a solution. I opened the zipper at the back of the jacket along the waist that allows access to the space between the waterproof liner and the shell so you can remove the foam back and chest pads. That zipper opening created an exhaust vent and reduced the ballooning effect. With it open, air flowed in the shoulders and down the back, but the cooling effect was minimal, at best, because there was no venting to the arms or chest. Rather than belabor the point, let’s just say that it’s best to consider the T-Jaws WP a jacket without venting. If you’re like me, and you like to have one jacket for fall, winter and spring use, and a mesh jacket for the hot, summer months, then the T-Jaws WP is a contender. But if you’re a rider who wants to buy one, do-it-all, four-season jacket and be done, the T-Jaws WP is not your best choice if you live anywhere south of the U.S.-Canadian border. The interior of the Alpinestars T-Jaws WP jacket: blue arrow, sewn-in Drystar waterproof lining; orange arrow, zip-in thermal liner; green arrow, zipper to attach to pants; red arrow, zipper that allows access inside the Drystar liner to remove foam pads and also serves as an exhaust vent when the front shoulder vents are open. Photo by Lance Oliver. Of course the advantage of the T-Jaws WP over its leather Jaws predecessor is its waterproof capability, and I put that to a thorough test. The results were mixed, and not particularly surprising. The good news is that water just plain does not get through the Drystar lining. The bad news you can probably guess by looking at the jacket. The T-Jaws WP has no rain flap or gutter to keep water from seeping through the main zipper, like you would find in more serious adventure-touring jackets, such as Alpinestars’ own Valparaiso Drystar jacket, for example (which is also considerably more expensive). As a result, when I encountered 150 miles of steady rain on a long day riding home from RevZilla HQ to my home office, water seeped through. Considering the cut and styling of the T-Jaws WP, it’s a jacket that is probably going to appeal to sportbike riders who may not ride in horrible weather but want to be able to handle an occasional shower without getting wet. If that’s your goal, the T-Jaws WP works. If you’re an adventure-touring, long-distance, or everyday-commuting rider looking for the best in foul-weather protection, there are better options. The T-Jaws WP has an eye-catching style, at least in the white, red and black version, but with those white panels, you’re going to want to keep it clean so your chest doesn’t look like the autopsy room at the insect morgue. 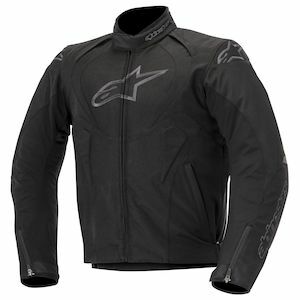 Alpinestars recommends hand-washing and hang-drying the jacket. Removing the armor was simple, and then I tossed the T-Jaws WP into the washing machine on the hand-wash cycle. It didn’t come out looking like new, but it came out cleaner. I appreciate the look of white, but I wish manufacturers wouldn’t use white around the collar. Inevitably, the collar rubs against my helmet, leaving behind black stains that don’t come off easily. Still, one of the advantages of a textile jacket over leather is the ease and lower cost of cleaning it, and the T-Jaws WP definitely beats its leather Jaws brother in that category. The T-Jaws WP is a three-season jacket (fall, winter, spring) that will keep you dry in a quick shower, though the zipper won’t stand up to an all-day deluge. If the sporty cut and styling appeal to you, and its limitations in terms of temperature range and waterproofness under extreme conditions are not a problem, it’s a stylish and attractively priced option. If you insist on buying one jacket to suit all riding conditions or you demand the best in weather protection, there are better options, both from Alpinestars and from other makers.